This September I’m getting a one way flight to Romania, so I can visit one of my old shipmate’s in Bucharest. After that… well, the plan is more subjective. That’s Bucharest, Budapest, Bratislava, Vienna, Prague, Berlin, Hamburg, Amsterdam, Brussels, Luxembourg City and Paris. 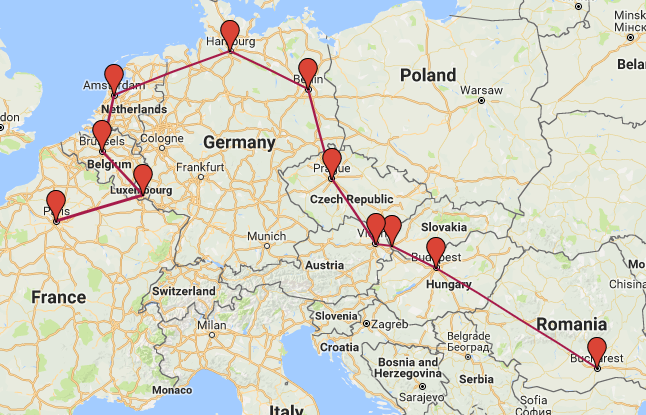 My rough time scale is 6 weeks, as I’m going to get around via interrail, which allows me to do 10 stops in a month, and then I’ll spend roughly a week visiting friends either end of the trip in Romania and Paris. The only country I’v ever visited out of all of those is France, so right now I’m digging deep to research all these cities to figure out what I want to see and do whilst I’m there. I’ve got a few ideas, but I’m still looking into things. I haven’t decided how long I’m going to stay in each city yet, I’m going to try and judge it from places I want to see from my research. To keep costs low I’m going to stay in budget hotels and hostels, but I’m not going to book them until I’m in the country before. If anyone has any recommendations, please send them this way!